piCture pOlish has recently released a new line of glitters and if you're one to spice up your manicure with a layer of sparkle, you will absolutely LOVE them! Today, I have one of them, Mardi Gras, to share with you and believe it or not, the girls from piCture pOlish actually sent me the one I was the most excited about! 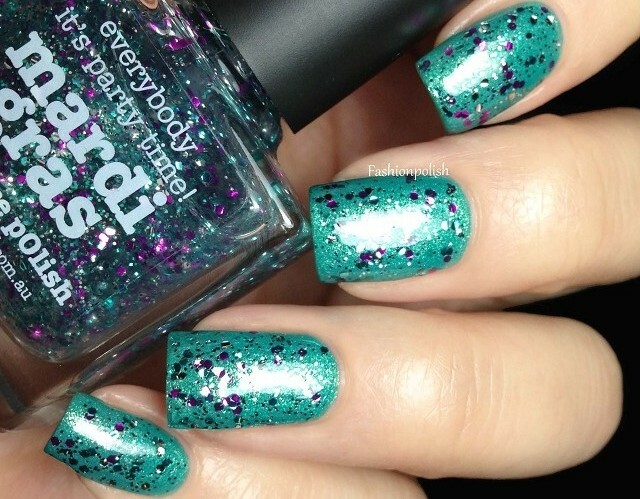 Mardi Gras is a mix of silver, turquoise and fuchsia glitter in a clear base. I love the color combination! It's exotic and fun, very different from what you would expect in November but definitely a huge win. The glitter applied evenly and I didn't experience any issue whatsoever. I was first going to apply it over black but then I saw Zoya Zuza and it felt like the perfect combination. This is 2 coats of Mardi Gras over Zuza plus topcoat. 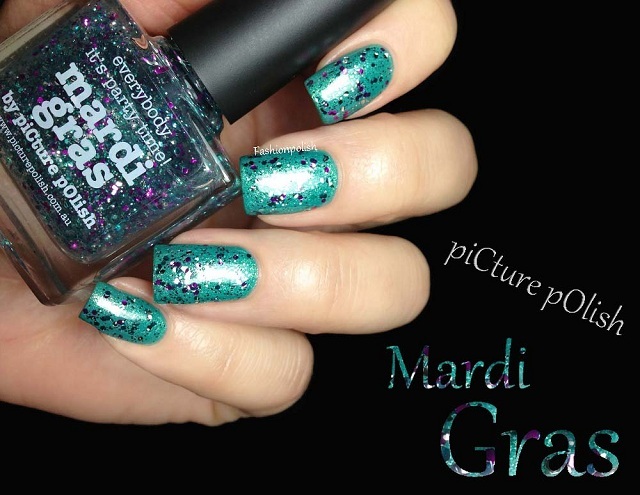 piCture pOlish Mardi Gras retails for AU$9.50 and can be purchased directly from piCture pOlish.com.au or through their international network. What do you think girls? Are you into glitters? Did you get any of the new piCture pOlish? I know I need Ruby Blou in my life! it looks so pretty! I love the fuchsia glitters in it! Oh my gosh great combo with the turquoise! Very pretty! That's a really special one! Never too early for a beautiful mardis gras polish! Perfect polish combo! I like Mardigras! Super fun. It looks great over that base colour - such a great colour combo! how pretty! i don't have any picture polish yet, but there are plenty that i'm dying to pick up!! I don't have any piCture pOlish yet but I love the glitter and the color combo!